Malcolm X and The Power of Small Things | "A Song Every Day"
Posted on May 19, 2017 by vspatz	in Community, Ethics and tagged Azizah al-Hibri, Malcolm X, MISC. “The fame we get from fighting for the freedom of others creates a prison for us,” Malcolm X wrote in 1964 to Azizah al-Hibri, then a college student at the American University in Beirut. Their brief in-person connection and subsequent correspondence are still treasured by Dr. al-Hibri, now retired as chair of KARAMAH: Muslim Women Lawyers for Human Rights, the international organization she founded. Moreover, the papers and their story illustrate some important things about leadership, race, gender, and media. Originally posted in slightly different form on May 19, 2015. Story published in East of the River, July 2012. As president of the college debating society, al-Hibri arranged for Malcolm to speak on campus while he was touring and also had the opportunity to get to know him during his brief visit. A shared ice cream at the airport launched a correspondence between the two that continued until his death in February 1965. 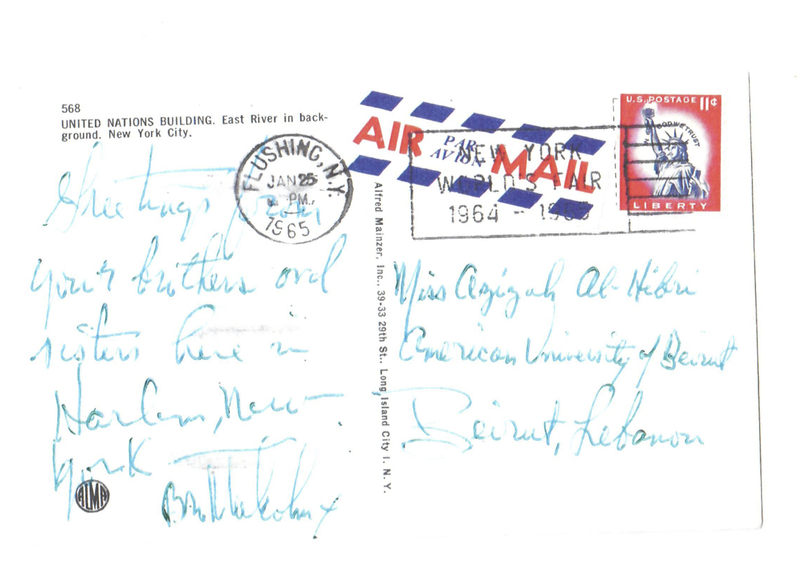 At his request, al-Hibri kept her correspondence private for over 40 years. In 2012, al-Hibri released a few pieces of correspondence and donated other papers (still private for now) to America’s Islamic Heritage Museum. She said then, in a speech at DC’s Masjid Muhammad, that she wanted to ensure that Muslims are “proud” and “happy” about connections with the slain leader and to forge bonds between the African American Muslim community, with historical connections to the Nation of Islam, and what many call the “immigrant” Muslim community, with different historical roots. From his correspondence it is clear that he already suspected that his life and work were coming to an end. But he knew, even though al-Hibri didn’t yet, that her future as a leader was ahead of her. I share this today, in honor of Malcolm X, El-Hajj Malik El-Shabazz (born Malcolm Little, 5/19/25-2/21/65). I share it in recognition of the work of Dr. al-Hibri and KARAMAH — a small, powerful organization. I share it as a shout out to the too-little-known Americas Islamic Heritage Museum. And I share it to acknowledge the hard and complex work of overcoming racism between religious brothers and sisters. Perhaps most importantly, I return to this story again and again as an example of the power of small interactions to shape our world. Originally posted on May 19, 2015.